Arbol ahorcado (The Hanged Tree) is a performance created by artist Marianne Evans-Lombe to honor a promise she made in Ciudad Bolivar, Bogota – Colombia. The promise was to return to the U.S. and tell a story from Colombia. The story is about a tree in Ciudad Bolivar, a tree where someone was hanged to intimidate a barrio. The barrio has re-claimed itself; is home to a healthy, vibrant neighborhood, full of services for its community members. But there, still, sits that tree. Arbol ahorcado was created to both preserve the cultural memory of the tragedy that took place there and as a visual symbol of the barrio’s transformation. 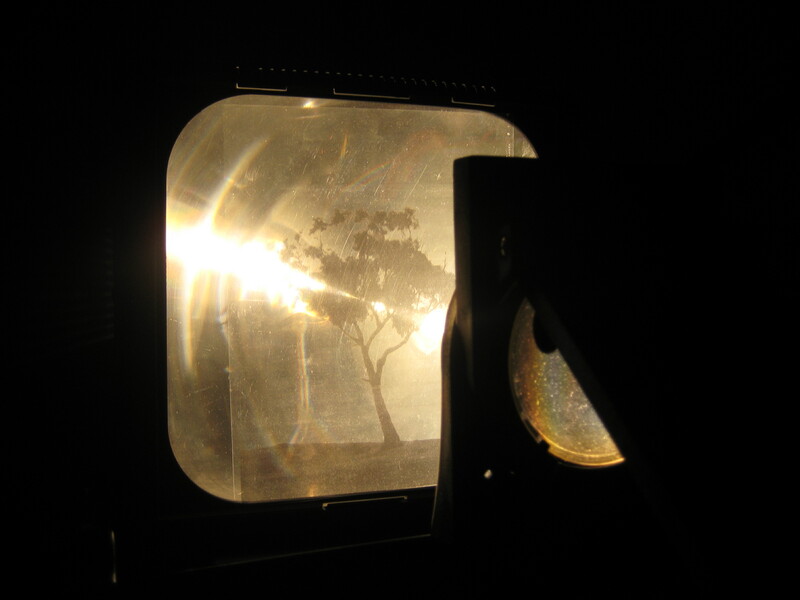 This is the overhead projector screen with the tree from my performance, Arbol ahorcado. It reminds me of an albumen silver print, a process where thin sheets of paper are first coated with egg white and salt, then floated on silver nitrate to make them sensitive to light. The image is created by printing under a negative in sunlight. The finished picture is fixed, washed, and often gold toned before mounting. a healthy, vibrant neighborhood, full of services for its community members. But there, still, sits that tree. Arbol ahorcado (The Hanged Tree) was created to both preserve the cultural memory of the tragedy that took place there and as a visual symbol of the barrio’s transformation. January 3, 2015 at 4pm, to bear witness to a story from Colombia that applies to our culture as well. There will be a panel discussion at St Aidan’s on Sunday, January, 4, 2015 at noon. The panel will follow the 11am church service. The panel will discuss the performance, any issues it brings up, how it relates to issues in Tulsa – especially those of racism, issues in Colombia, lynching, Transforming Hate, etc. There will be a paper workshop facilitated by Malachi Muncy at St Aidan’s on Sunday, January, 4, 2015 at 1:30pm. The workshop will follow the panel discussion. The audience is invited to participate. 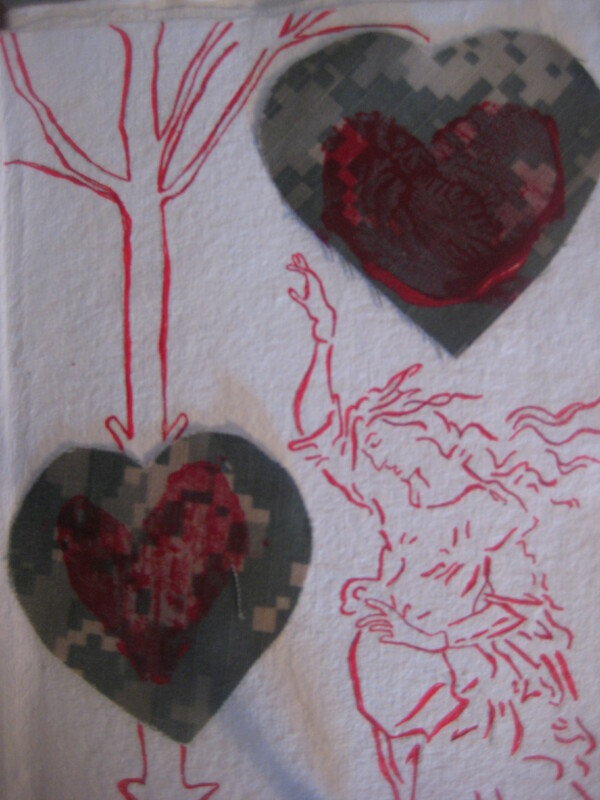 Participants will form sheets of paper from military uniforms used in Arbol ahorcado (The Hanged Tree) and pulp print images of the tree and hearts from the performance on these sheets. This is the tree and her angel in the performance ‘Arbol ahorcado’. This part of the performance is the beginning of the illumination of the ‘shadow’ tree traced onto the floor from hearts cut from military uniforms.